wall beds Archives - More Space Place Our Murphy beds are custom-built to your exact preferences, ensuring a bed that is comfortable, personal, and tailored to your needs. Get in touch with the team at More Space Place Sarasota today! 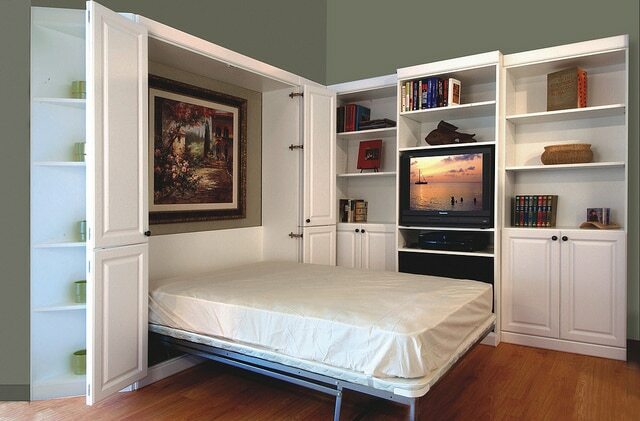 Wall beds, also known as Murphy beds, are a convenient space-saver for many Sarasota homes. Is a wall bed the right choice for you? There are a few important questions to ask yourself before installing a wall bed. Once you’re ready, More Space Place is here to help! How often will I use my wall bed? 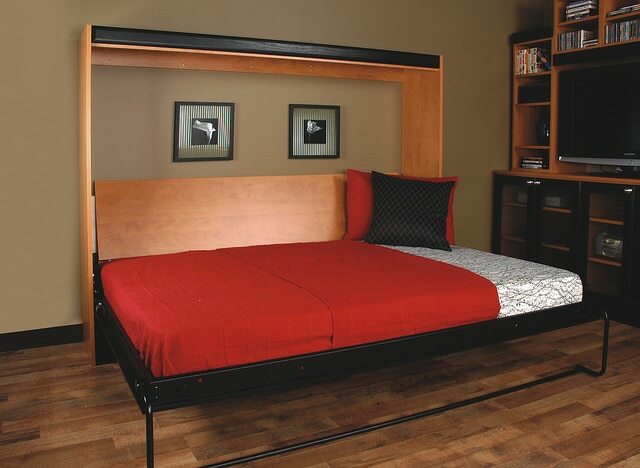 Our modern wall beds make storing your bed and pulling it out for later use a simple, easy task. For studios and small spaces, your wall bed might be moved up and down daily. In this case, it’s smart to avoid decorating your new space with heavy furniture – that furniture will have to be moved whenever you want to use your bed. For a guest room, your wall bed could remain hidden most of the time. This gives you more freedom with decorating. What will I do with the extra space? Wall beds open up a lot of space, and it’s smart to consider how you’ll take advantage of that extra room. Are you designing for a small home or studio? Transform your bedroom into a living room by day! Are you considering a wall bed for a guest room? Give your guest room dual purpose: transform it into an office, living space, reading nook, or game room when it’s not in use. If you’re thinking about a wall bed for a child’s room, consider how they might use the extra space. It could be the perfect play spot for a younger child, or desk and study spot for teens. What style of wall bed do I want? More Space Place Sarasota offers a wide selection of wall bed styles. We allow you to personalize your wall bed with custom-built shelves, cabinets, and more! From traditional and classic to sleek and modern, we can create the perfect wall bed for your life and style. Consider how a wall bed could enhance the look of your home. A classic look is bi-fold doors, which appear to be a closet when folded up. Shelving is an excellent way to add even more storage space to your room. If you love to read, we can design the perfect bookshelf wall bed for you! Get Started in Sarasota Today! Are you ready to upgrade your life with a custom wall bed? Get in touch with our team today for a free design consultation! Create and customize the perfect bed with our team of experts. We have three convenient locations in Sarasota, Bradenton, and Port Charlotte. Most of us want the things we keep in our homes to help make our lives easier and more comfortable. Universal remote controls, soft blankets, and plush rugs are testaments to this. 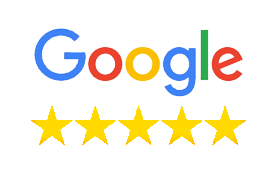 At More Space Place of Sarasota, Bradenton, and Port Charlotte, our goal is to provide brilliant and beautiful custom space-saving solutions for your home that also improve your life. Our most popular product, the Murphy bed, is one that offers a variety of benefits that can make your life easier in more ways than one. One way in which a Murphy bed can make your life easier is to relieve the stress often caused when out-of-town guests come to stay. If you have a place designated for guests to sleep at the ready, you can avoid the stress that comes with preparation. Murphy beds are safe and easy to operate, and you can even store them with the bedding made. This makes even the accommodation of last-minute guests a breeze. Without having to deal with the hassle and disruption of finding extra pillows and blankets for the living room couch, you can focus on enjoying the company. Making the most of your available space is important, especially in smaller homes where space is particularly precious. Murphy beds are great space savers, as they can be stored away when they’re not needed, thus freeing up valuable room on the floor. Many wall bed models can even be enhanced with additional storage components like cabinetry, drawers, and shelving. This is a great solution for areas of your home where your storage may be lacking. Trying to find sufficient storage space for your belongings can oftentimes be very frustrating. 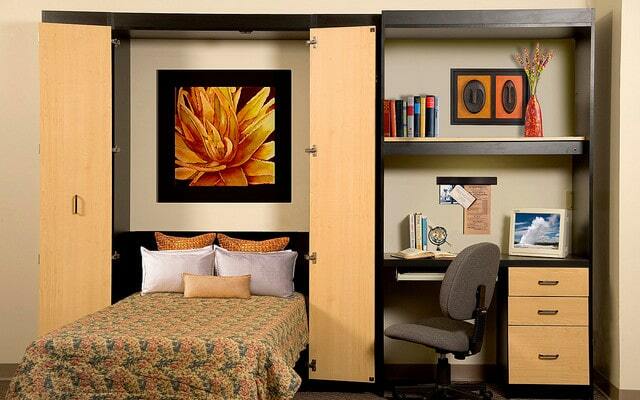 Make your life easier by installing a two-in-one Murphy bed and storage solution! The ability of Murphy beds to create dual-use spaces can significantly increase the functionality of your home. Adding a Murphy bed to your spare room to create a home office and guest room combo is a common way to achieve an efficient multi-purpose space. 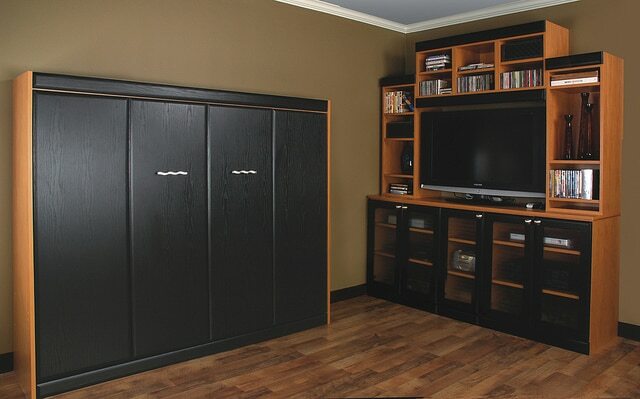 If you don’t have a spare room, you can even install a Murphy bed in your family room as a part of your entertainment center. This solution allows your family room to stay open for movie nights, social gatherings, and relaxing while also holding the potential for accommodating overnight guests. If you want to learn more about how a Murphy bed could enhance your home and make your life easier, contact your local experts at More Space Place today! We have three convenient locations in Sarasota, Bradenton, and Port Charlotte, and we also offer free in-home design consultations. 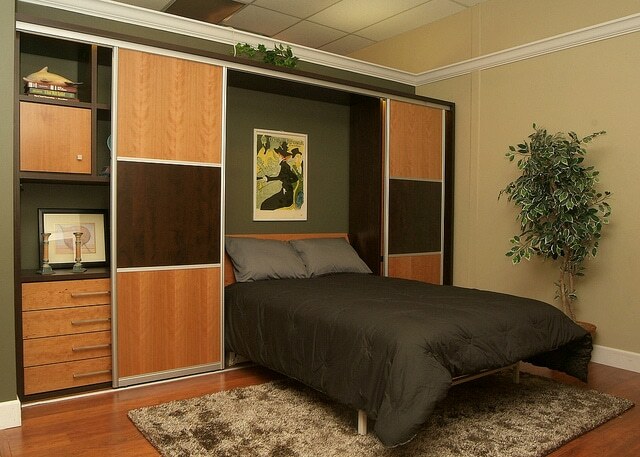 More Space Place is your premier Murphy bed retailer in Sarasota. 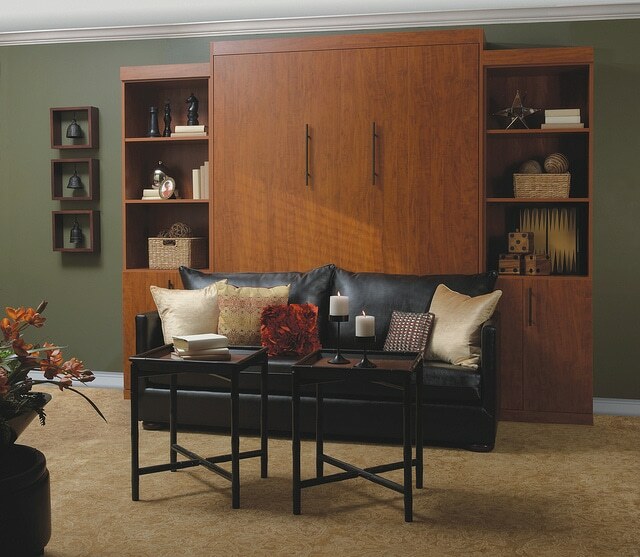 With 11 stylish designs and dozens of customizable options, we can build the Murphy bed that is right for you. We also carry Serta mattresses specifically designed to withstand the vertical storage conditions that are either 8” or 12” in width. Many Sarasota homes disregard the idea of a Murphy bed because they think of a squeaky, uncomfortable mattress in a cramped city apartment. While original models may not have been the most desirable option, modern Murphy beds have come a long way since then. Get to know some of our favorite models and find out why a wall bed is a great option for your contemporary home. At the most basic level, the Murphy bed unit is still incredibly useful and stylish. It has two bi-fold doors that hinge at the middle and overlap to the sides of the unit. It is available in every mattress size from twin to king. You also have the option to add cabinetry for extra storage. Rooms that need to double as a living space and a guest room should consider this model. 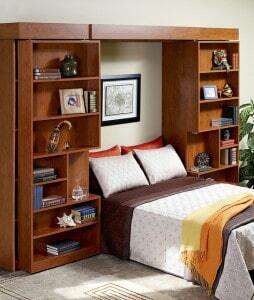 Instead of folding to the side, the Jefferson Library Bed has bookshelf doors that slide on a smooth tracking system. 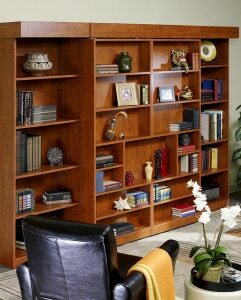 The 30” side shelving and bookshelf doors have a very elegant aesthetic great for a modern home. This option is available for full and queen sized mattresses only. 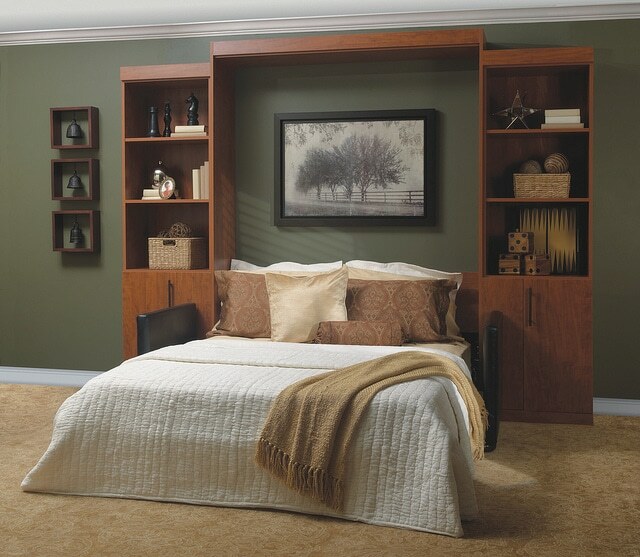 If you like the Jefferson Library Bed but have limited space, the Madison Bi-fold Bookcase Bed is a great substitute. When closed, it looks nearly identical to the Jefferson but instead of tracked doors, these hinge at the middle and fold without requiring extra space on the side. The following panel beds have unique designs that maximize the space and opportunities available in your room. The key difference between Murphy beds and panel beds is instead of doors opening to reveal the mattress, the door is part of the bed frame. This saves space and adds more support underneath your mattress. For homes with low ceilings or those wanting a more contemporary look, consider the Cosmopolitan panel bed. Instead of storing the mattress vertically, the mattress is stored horizontally. If you are looking to put a panel bed in a child’s bedroom, a cosmopolitan will be easier for them to reach and use without relying on you each time. This panel bed includes 16” side cabinets for extra storage in your room. It has built-in drop down nightstands that can be stored when you aren’t using the bed and pulled out when needed. This is an excellent option for a part-time guest room to give your friends and family the feel of a fully functional room. It is available from twin to queen. This panel bed is the best design for a small multi-use room. The key benefit of the Chesterfield is a stylish and customizable sofa attached to the unit. However, there is no need to move furniture when you need to use the bed. Simply remove the cushions and allow the mattress to rest comfortably between the armrests. This panel bed option beats that clunky futon you’ve had in every way. It is available for full or queen mattresses. Modern Murphy and panel beds offer stylish, comfortable, and practical designs to make the most of your room. If you would like to see the Murphy bed designs in person and check out more of our customizable options and models, come visit us at More Space Place Sarasota! In many Port Charlotte homes, the attic is a forgotten space used exclusively for holiday decorations and dusty storage boxes. 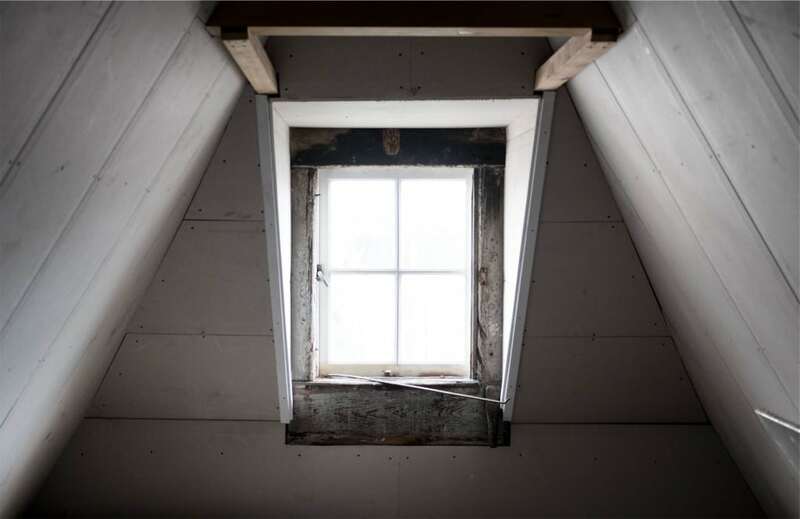 However, with a little TLC and some help from the experts at More Space Place, you can transform your attic space from a chilly storeroom to a cozy getaway. Read on to learn how. Whether you want to turn your attic into a library, a home office, or a multi-purpose media and hangout room, defining the purpose of the space will help guide you through the transformation process. At More Space Place, we specialize in creating custom storage solutions to fit any space or lifestyle. Depending on the room’s purpose, a custom office desk, built-in shelving to hold your books, or a custom-designed media center can help you accomplish your goals. If the attic in your home is like many others, it probably is made of old wood floors. If you’re lucky and the wood is in good shape, these floors can lend a classic appeal. However, you can add an area rug on top of the flooring to cozy up the space. If you really want to go for it, consider redoing the floors altogether. Carpet is a good choice, as it not only warms the space but can also help insulate the sound to and from the rest of the house. Another way to create a cozy atmosphere in the attic space of your Port Charlotte home is to install a wall bed. At More Space Place, we work with you to create custom solutions to perfectly fit your space. If you have the low, slanted ceilings common to many attics, a horizontal wall bed may be a perfect solution. These comfortable beds fold out horizontally rather than vertically, which means they don’t need as much space for height. Adding a wall bed in your attic can turn the space into a multipurpose room. The bed can allow the room to be used as a guest room or a cozy escape for reading and relaxing. The final step in creating the perfect cozy attic is to add your own personal touches. Blankets, pillows, and wall hangings will take the space from functional to welcoming. Use mood lighting and interesting lamps or fixtures to add character and warmth. Beanbag chairs can be a fun seating solution if you’ll have kids using the space. If you’re ready to get started in turning your attic into a functional and cozy space, call the experts at More Space Place Port Charlotte for a free-in home storage and design consultation! When looking to increase the space in their homes without knocking down any walls or completing a home renovation, many Sarasota homeowners look for alternatives. 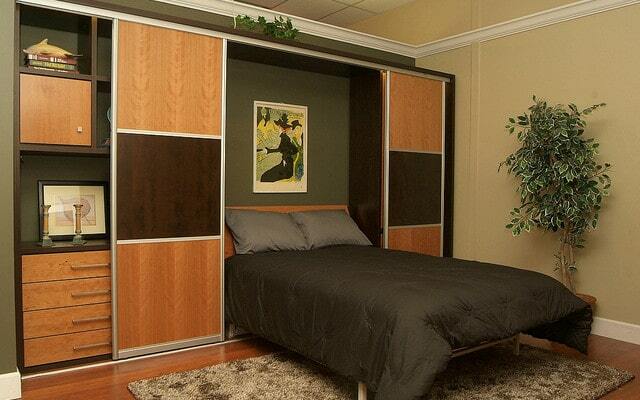 Here at More Space Place, we are big believers in the power of a Murphy bed. 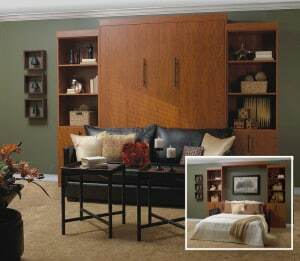 Murphy beds are versatile wall beds that bring many benefits to a home. Here we’ll explore some of these benefits that make Murphy beds great additions to any space. One of the greatest benefits of a Murphy bed is the extra floor space it frees up when installed in place of a traditional bed. Since Murphy beds fold away when they’re not needed, they don’t take up any space on the floor, making the space available for other uses. Whether you live in a small studio apartment and your bedroom doubles as your living room, or you have young kids who enjoy extra floor space for playing, a Murphy bed is a great space-saving solution. Another great thing about Murphy beds is they’re easy to operate. The counter-balanced design allows for easy folding of the bed that can usually be done with just one hand. Unlike futons, sofa beds, and other alternatives, Murphy beds are operated using a simple and safe maneuver and can be folded up and down with ease. You can also store them with the sheets and bedding on the mattress, allowing for even more convenience and quick access. Achieving multipurpose rooms in your Sarasota home is another wonderful benefit of Murphy beds. This is especially true of smaller homes where space is limited. Some common combinations include the home office and guest room arrangement. Many of our custom-made Murphy beds can include a built-in desk on one end with the folding bed on the other. That way you can have a home office for your day-to-day use while also having a comfortable guest room when friends or relatives come to visit. Another versatile setup is the child’s bedroom and playroom combo. If you don’t have an extra room to devote entirely to your children’s toys and play time, adding a Murphy bed to their bedroom can double it as a playroom. 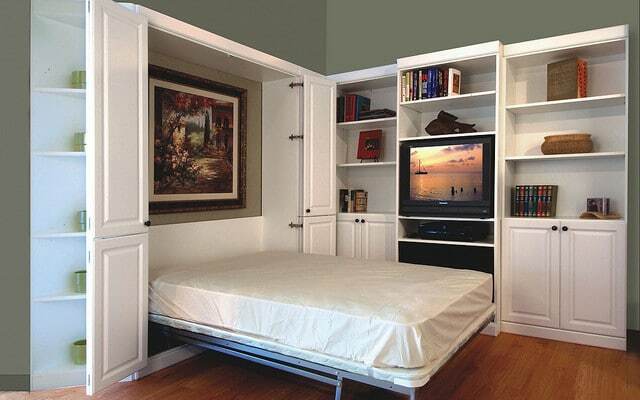 In addition to the benefits discussed above, there are many other great perks of installing a Murphy bed in your home. For more information or to schedule a free consultation, contact your local experts at More Space Place Sarasota today! Finding enough space for our needs and those of our family can often require some juggling here in the Sarasota, Bradenton, and Port Charlotte, Florida, areas. This is especially true if you have children. Perhaps you’ve experienced the challenge of finding enough space for the kids to play and the frustration of tripping over toys scattered throughout the house. Between games of hide and seek, building Lego towers, and making arts and crafts projects, kids require a lot of space to play and plenty of room to stretch both their legs and their creativity. If their bed occupies the majority of floor space in the child’s bedroom, games may tend to spill out into other areas of the home, which ends up requiring more cleanup for the parents. If this is the case in your home, consider adding space to your child’s room with the addition of a wall bed. One of the best reasons to add a wall bed to a child’s bedroom is that it allows for the room to achieve multi-functionality. By having a bed that easily folds down at night and back up in the morning, your child can have both plenty of floor space to play and a cozy bedroom for sleeping. Adding more space to play will keep more of your child’s toys in their bedroom and less in the other living areas. It will also give them more space to play that feels like their own. 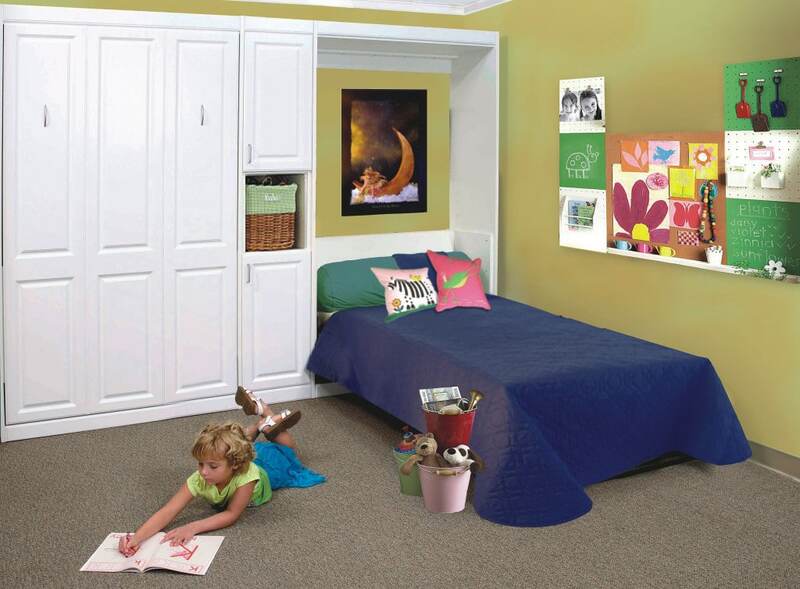 In addition to adding more floor space for playing, wall beds can also add more storage to your child’s bedroom. Many varieties of wall beds come with built-in shelving, drawers, and storage compartments. At More Space Place, our custom furniture is made specifically to work for your needs. The extra storage that comes with many of our custom wall beds works great for storing children’s toys in places where they can reach and access everything themselves. The drawers work well for storing smaller items that tend to get lost, and the shelves can display your child’s book collection, allowing easy access for nightly story time. Here at More Space Place, we proudly serve the Sarasota, Bradenton, and Port Charlotte areas of Florida’s Gulf Coast. Our custom furniture comes in many different styles and finish options, so you can find the perfect fit, both practically and aesthetically, for your home. To schedule a free in-home estimate and consultation with one of our experts, give us a call today! We can help turn your child’s bedroom into a multi-functional playroom with one of our custom wall beds.